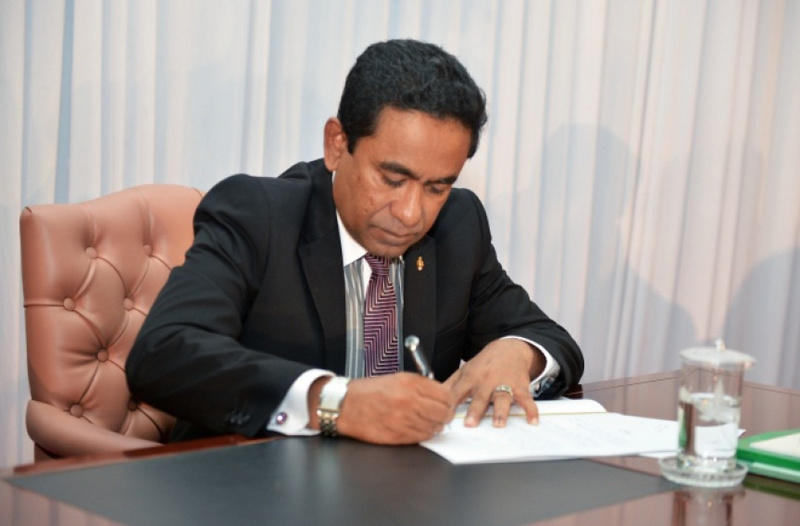 President Abdulla Yameen Abdul Gayoom has ratified two amendments to Presidential Elections Act, including the amendment banning anyone who held foreign citizenship or asylum from competing in presidential elections for at least 10 years after he renounces his foreign citizenship or asylum. Yameen ratified the amendments to the Presidential Elections Act – passed by People’s Majlis on July 4 – this Monday. The amendments have now been published on the Government Gazette. The amendments took affect the moment it was published on the Government Gazette. The new provision to Article 7 (b) of Presidential Elections Act says that as Article 109 (a) of the Maldivian Constitution sets the condition that presidential candidates must be born to Maldivian parents, in the event that the individual held citizenship of a foreign country or asylum from a foreign country, he will be able to compete in presidential elections only after at least 10 years of renouncing the foreign citizenship or asylum. Yameen also ratified the amendment to Article 9 (b) of the Presidential Elections Act, increasing the administrative fee for presidential candidates from MVR 40,000 to MVR 100,000. Elections Commission has said candidacy for Presidential Elections 2018 will be opened on July 15. The election is scheduled to be held on September 23. Incumbent President Yameen has already announced he will be running for re-election on behalf of ruling Progressive Party of Maldives (PPM), while the opposition has declared leader of Maldivian Democratic Party (MDP)’s parliamentary group, MP Ibrahim Mohamed Solih (Ibu) as their presidential candidate. Former Minister of Home Affairs, Umar Naseer, and former Deputy President of Local Government Authority (LGA), Shujau Hussain will be competing as independent candidates.